Winter is coming. Wouldn’t it be nice to have an endless summer, though? That way you could use your pool year round. Still, in Maryland and other nearby states there comes a time each year when it’s time to “close the pool for the season.” After the weather turns to cooler temperatures on a daily basis it’s time to “winterize” your pool. 1) Do it before it snows. 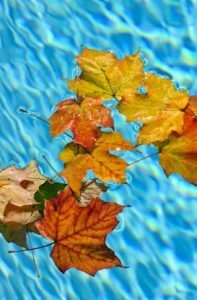 Most people winterize their pool sometime during the months of September or October. 2) Do leave some water in the pool itself. Did you know that, for above-ground pools, leaving water at swim level works to support the pool cover? Generally, water in the pool won’t freeze all the way down in winter. There’s such a thing as a pool winter pill, which is a ball that floats in the pool water, releasing chemicals that prevent scaling and algae buildup. It’s a good addition to the pool for the winter season. 3) Do pay attention to the chemicals. For instance, for in-ground pools, add a little antifreeze in the plumbing lines after the water has been blown out. Whatever water is left inside the pool should be chemically balanced as if people were going to swim in it. 4) Do cover the pool with a sturdy pool cover. This cover should be in good condition and tightly secured. You can use an automatic pump to remove water from the cover’s surface to prevent too much pressure building up atop the pool cover over the course of a wet, snowy winter. 5) Do store pool equipment indoors for the winter. For example, take the pool’s detachable ladder and put it in a shed or basement so it doesn’t have to deal with snow and ice buildup. 6) Do consider hiring a pool professional to winterize your pool so that it’s all done properly. The cost generally ranges between $125 and $400 for this helpful service. If you have any questions, call VistaPro Pools & Spas of Davidsonville, Maryland, at 301-805-0119. VistaPro serves Annapolis, Washington DC and the Northern Virginia region.